Today I am joining in on the Growing in Unity Blog Hop. This hop is just for fun, and is a great way to reconnect with the Spring Growing in Unity Girls and share our love of Unity Stamps! 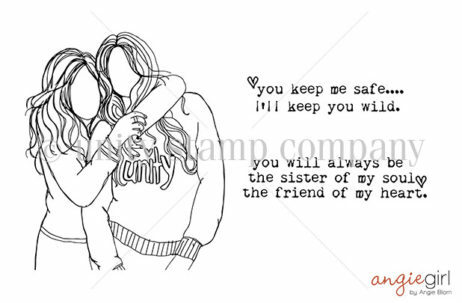 Today I have chosen to use a friendship stamp designed for Unity Stamps by Angie Blom. It is from the March release, called Unity Girls. I'm a huge fan of the Angie Blom and her Angie Girl series. They are so much fun to color and have wonderful sentiments. I have been loving watercolors lately, and recently just got a few of the Prima Confections watercolor tins, so I chose to use them for today's project. I enjoy no-line coloring and watercolor, so I stamped my image in a very pale gray ink, so the lines would hide beneath my coloring. I love to paint in the hint of faces on these face-less Angie girls. Here's a closeup of just how simplistic it really is. It's an optical illusion of sorts. Just enough shadow and highlight forces the eye to subconciously fill in the rest of the face. I added a quick light background wash and once it was dry. I used a stitched die to trim down my watercolor panel a bit. Before adhering it to my layered card base I stamped my sentiment in Versafine Black Onyx ink. Thanks for visiting and hopping with us today. 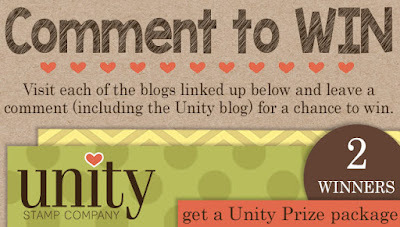 Please visit all the blogs and be sure to comment to enter to win prizes from Unity Stamp Company! They are always so generous with their prizes! No lines! Fabulous idea! Angie Blom is my favorite too! You did her stamp beautifully! This is so pretty! I like your use of shadow and light. this is fabulous!!! Love your coloring on this beautiful stamp!! The results of your talent never seizes to amaze me. I LOVE your no-line stamping/coloring and how you do your faces! I wish I could do that! Every time I see one of your creations I think to myself "I wish I could do that". Thank you for sharing! I love this card. Great job!! Simple, no lines, great coloring, great card ! Stunning! I love the no-line water coloring you have done. Wow! The finished result is awesome! Wow! Amazing job! Can not find words to express how much I love this! Just wow! Amazing as usual... I love your work, Chris. Great card! Watercolor is my favorite was to color stamped images. That is wonderful! Beautiful colors and beautiful work! I have not attempted the no line coloring...I love the look. May just have to try. Thanks for tge inspiration! Thanks, Chris. You are so gifted, and I love the Angie girls, too. Your watercoloring is amazing...I especially like the hint of shading on the faces...it really makes a huge difference and I would have never though of that. Thanks for sharing. Omg I love love love this card. Setting aside some time to try ur method. Although my water coloring is terrible compared to u.
times so far, but need practice! Very nice watercoloring. I have just begun watercoloring on cards and am having a lot of fun. so pretty with the watercoloring. Gorgeous! Your watercoloring is beautiful! You and Annie are so good at this no-line watercolor. Love how you have the illusion of the faces and the 3-D quality to your card. Amazing and inspiring!!! I always enjoy seeing other people's ideas. I am in love! Your cards are so lifelike and I need this stamp now! Beautiful!!!!! Stamping with the pale gray really gives your work the look of a watercolor painting once it is all colored in. Neat tip! Wow, great job with the no-line technique. I need to give this technique a try. Fabulous job on the no-line water coloring! Beautiful card! The more I see this stamp set the more I want it :) Thanks for sharing! Love this!! I haven't tried this technique yet, but you've done it perfectly. Thanks for sharing your talent. Your card is so pretty! Love the no line look! Gorgeous card. Love the softness in the card. Oh my! I REALLY have to try this. Thanks for sharing!! I so love this coloring technique!! Wow!! This is fabulous! I love your coloring. What a great card. It really makes me want to try the no-line watercoloring even though I am a little intimidated by how wonderful this is. Beautiful no line technique! I love the Angie girls too! I saw this card on the Unity page and loved it. The no line watercolor looks Amazing! Thanks for sharing. Wow!!! What a fabulous job!!! Fab card! That no line water-coloring technique is executed perfectly. OMG you coloring amazing!!! I love your card is stunning! Oh this is beautiful and another push to try no line water coloring! Loving this hop! WOW, stunning no line coloring!